Irlam Viaduct is a minor waterways place minor waterways place place on the waterways major waterways place village town city on the Manchester Ship Canal (Main Line) between Walton Junction (Junction of Manchester Ship Canal Main Line and Walton Lock Branch) (9 miles and 1 furlong and 1 lock to the west) and Pomona Dock No 4 (Junction with Branch to Bridgewater Canal) (7 miles and 2¼ furlongs and 3 locks to the east). 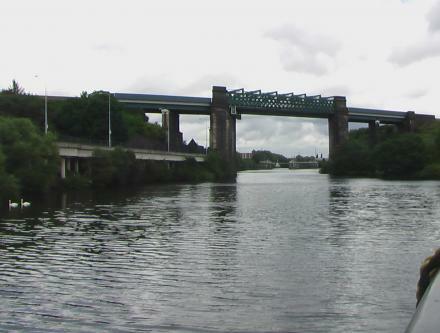 The nearest place in the direction of Walton Junction is Mersey Weir; ¾ furlongs away. The nearest place in the direction of Pomona Dock No 4 is Irlam Locks; 2½ furlongs away. Gazetteer for Irlam Viaduct a minor waterways place on the Manchester Ship Canal (Main Line) showing information and facilities about the place. Dec 19, 2009 ... Looking back at the CLC viaduct at Irlam along with the Mersey wier inlet. Mar 28, 2017 ... Cadishead Viaduct as it is now Credit: Hamilton Davies Trust ... of the former Cheshire Lines railway from Irlam to Timperley, near Altrincham. Apr 14, 2011 ... Irlam to Liverpool aboard Calemax Enterprise 19/12/09 ... Calemax Enterprise arriving at Irlam locks. Calemax ... Irlam viaduct and Mersey weir. Irlam Railway Viaduct, Manchester Ship Canal Manchester to Liverpool Line. Apr 9, 2010 ... Looking back as we pass underneath Irlam railway viaduct. Ferry Rd, Irlam, M44 6DN — 886 yards to the north. Media House, Adlington Business Park, Manchester, SK10 4NL — 1317 yards to the southeast. 557 Liverpool Road Irlam, Manchester, M44 6ZT — 1059 yards to the west. Manchester — 398 yards to the southeast. 524-526 Liverpool Rd, Irlam, M44 6AJ — 1099 yards to the west. Manchester — 1285 yards to the northeast. 6 Moorfield Parade, Liverpool Road, Manchester, M44 6FF — 1486 yards to the north. 621-623 Liverpool Road, Irlam, Manchester, M44 5BE — 1196 yards to the west. 246 Liverpool road, Manchester, M300SD ECCLES — 1170 yards to the northwest. Liverpool Road, Manchester, M4 4 6 — 832 yards to the northwest. Irlam, Manchester — 900 yards to the west. Manchester — 1533 yards to the northwest. Liverpool Road, Irlam, M44 6BR — 823 yards to the northwest. Manchester, M44 5 — 1541 yards to the west. compton close, Flixton, M41 6WG — 1020 yards to the northeast. Liverpool Road, Manchester, M44 — 998 yards to the northwest. Excalibur House, 630 Liverpool Road, Irlam, Manchester, M44 5AD — 1503 yards to the southwest. 559a Liverpool road, Irlam, M44 5BE — 1140 yards to the west. Manchester, M31 — 1368 yards to the southeast. Based in Irlam, Manchester — 911 yards to the west. Irlam — 713 yards to the south. 677 Liverpool Road, Manchester, M44 5GQ — 1212 yards to the west. Carrington Business Park, Manchester — 1283 yards to the southeast. 312 Liverpool Road, Manchester, M44 5UG — 922 yards to the northwest. Caroline Street, Irlam, Manchester, United Kingdom, M44 6AE — 1178 yards to the west. Manchester — 935 yards to the west. 67Liverpool road irlam, Manchester, M446EH — 1492 yards to the north. Fairhills Industrial Estate, Manchester, M44 6BL — 694 yards to the west. 544 Liverpool Rd, Irlam, Manchester, M44 6AJ — 1008 yards to the west. Irlam — 823 yards to the west. Cutnook Lane, Manchester, M44 6JS — 1624 yards to the north. Unit 18 Thames Trading Estate, Irlam, M44 6BP — 1006 yards to the west.